This jacket has a VERY wide range of adjustment through the mid-section. There are two side adjusters that work well. In their wide-open position, they will allow for a roomy belly, but they can also be snugged up by several inches for flat bellies. You can see in our fit check pictures, we’ve snugged them in almost to the max to get a good fit on our standard size mannequins. I checked the size XL on this and with the adjusters fully open, the max belly was about 46” and fully adjusted in, it was about 40”. So really this jacket can be made to work for just about any body type, and I’d suggest choosing almost solely on your chest size and the size you normally wear in men’s clothing. When I saw the name “Joe Rocket Ballistic Adventure” jacket on the list up next for a review, I was expecting to see a slightly improved version of their long running series of textile jackets, but I was really quite surprised to see something different here! Nearly every brand we carry is now making an “adventure” jacket… generally a 3/4 style like this with tone-on-tone grey or tan/brown styling. Some are “me too” and some have something a bit new and different to offer, and I’m happy to say I see some things that ARE new and different here. Ok, a few little things to file under “what’s different”: I like the snap closures on the jacket… have a look at those closeups. I think they’d be durable and easy to manipulate with gloves. The hydration pouch… this is one I personally could forgo in lieu of a stop at a 7-11, but for those who hit it a lot harder than I do, it is a nifty feature. Let’s start with the stuff that isn’t new and different… The shell is a nicely tailored textile material with a variety of colors and textures…and even with some night reflectives built in too (see our night shots in the photo gallery). 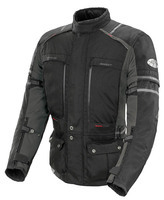 The jacket comes with CE armor in the elbows/shoulders and has a removable back pad. I’d give the jacket an average rating for pockets. There are two large front pockets and one BIG fanny pocket, and an errrr, odd arrangement of pockets on the inside. Take the pics link to see, but inside there are the standard two pockets accessible if you are using the thermal liner, none accessible with just the rain liner (and no thermal liner), and one available with no liners. This is a very preventable design miss IMHO, but most people will be fine with what is here. The dual liner system seems to me a standard thing for many manufacturers these days. You can use either the rain liner, the thermal liner or both depending upon the conditions. And you can even use the rain liner as a stand alone casual jacket (a feature once commonly found in FirstGear jackets). I think this is a great idea even if you never have occasion to use it… it is sort of a “why not” feature if you ask me. You can even wear the thermal liner under the casual rain liner too. And the big advantage to this liner setup is that for warmer weather, without either liner installed, the jacket will flow a lot of air and be useful even in warm or hot weather. The air flow subject is a great time to start on the things that ARE different about this jacket… the two large vents in front are a fantastic new idea. I’ve seen a couple similar set-ups lately from both Alpinestars and REV’IT! but I think this one gives the largest intake area and has the most clever way to tuck away the textile panels when in use. The way the large panels are tucked in their own little “garage” is really clever. Also, the sleeve ends have two-way zippers that allow you to get some air injection up the sleeves. One little design miss is that the lower sleeve tightness adjuster effectively closes off the vent when open. Again, an avoidable design flaw. Oh well, the front intakes will make up for it. Finally there are a couple shoulder zip vents and two LARGE rear exhaust vents. And the final feature for hot weather use is the zip-off sleeve feature. Hmmm…. I think if it is so darn hot I have to remove my elbow armor, it’s time to get a mesh jacket, but anyway, the feature is there if you dare. PS: One final little tip… I have a short wide neck and found the collar of this jacket to be too tall for me. Most jackets like this have a “keeper” to hold back the collar closure when not in use, but they missed that on this jacket. But I found a handy patch of Velcro that works perfectly for this… see the photo.